Today, I am sharing with you the April special which is especially for New Consultants. I can still remember opening up my New Consultant Kit 8 years ago. I began my journey with Close to My Heart because I was in love with the wonderful products. I liked everything and was impressed with the quality. I am so happy to be a part of this great company. They pay close attention and listen to both consultants and customers. They have held that high level of quality and continue to produce product that I love. 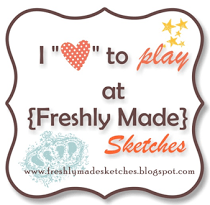 I started out simply for a discount on my scrapbooking supplies and worked to stay an active consultant. Next I started a monthly club and my goal was to earn enough to pay for what I was purchasing, basically to support my habit ;-). It is so much fun sharing my passion for scrapbooking and crafting with customers and teaching new techniques. Now I am at a point in my life where I am ready to invest more time and my current goal is to grow a team. The layout I created today truly shows why I became a CTMH Consultant. These pictures of my youngest daughter just make my heart full. They show her character and free spirit. Scrapbooking allows me to feel this over and over, while I am creating my layout and when I go back and look through my scrapbooks. Scrapbooking gives me a creative outlet and adult “play” time. I have also chosen some of my favorite CTMH products to showcase. I love the quality of the My Acrylic Stamps and the Page Protectors. Flip Flaps have the same quality as the Page Protectors and are a great way to expand my pages when I have more photos to share. And I chose my favorite paper, Kaleidoscope. Supplies used: Kaleidoscope Paper Packet, Diamonds Are Forever Stamp Set, Inks (Gypsy, Cotton Candy, Pear ), Cardstock (Gypsy, Pear, Crystal Blue), Artbooking Cricut Collection, Pink Enamel Gems, Bitty Sparkles, 3D Foam Tape, and 4×6 Flip Flaps. I also used a couple of my must-have, use-all-the-time, can’t-scrap-without tools when creating this layout: Versamat, Tweezers, and Ruler. If you have ever thought about joining Close to My Heart, this month is a great time to do so! There are so many great benefits for you from the low-priced New Consultant Kit with $50 in Select Product Credit to a FREE Cricut Collection or an additional $100 in Select Product Credit and then there are Straight to the Top Rewards on top of that! Whether you want to join as a hobbyist or make this a business, I can help you with whichever is right for you. Join today! If you are following the hop, you should be coming from Michelle Battitori and Wendy Coffman is your next stop! I love how you created your own paper with the gems from the Diamonds Are Forever stamp set. Great layout! The use of flip flaps really makes this layout shine, and I love the bold title! Great layout, I love the random stamping with the Diamonds are Forever stamps, the zip strips, and flip flaps. Tu Tu Cute! Darling photos. 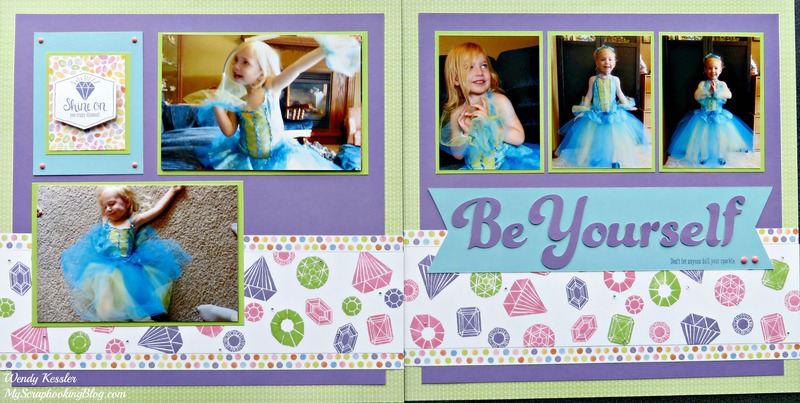 Fabulous layout with the random stamped gems!